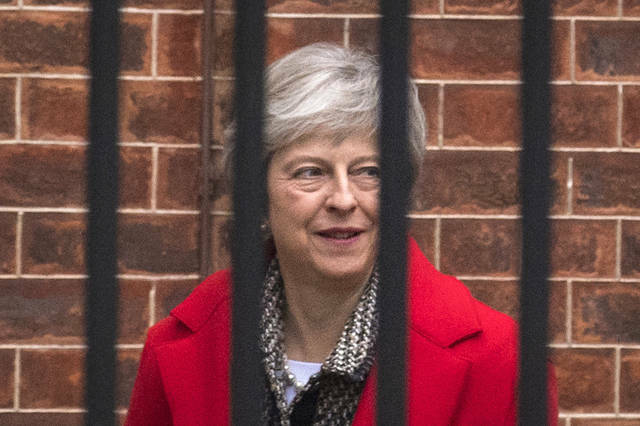 LONDON (AP) — Supportive Cabinet ministers rallied around British Prime Minister Theresa May on Friday, trying to bolster her leadership after a barrage of resignations over Brexit, as rebel lawmakers pushed to force a leadership challenge. May is battling to save her Brexit plan, and her job, after the draft withdrawal agreement between Britain and the EU sparked fierce opposition from politicians in her Conservative Party who want the U.K. out of the bloc. They say the agreement, which calls for close trade ties between the U.K. and the EU, would leave Britain a vassal state, bound to rules it has no say in making. A group of hard-core pro-Brexit Conservative lawmakers is working to topple May by submitting letters saying they have lost confidence in her leadership. They are aiming for the magic number of 48 — the 15 percent of Conservative lawmakers needed to trigger a challenge to her leadership under party rules. If May lost her job as party leader, she would also lose her position as prime minister. If May faces a leadership vote and wins, it could strengthen her position, because the rules say she can’t be challenged again for a year. She appealed directly to voters by answering questions on a radio call-in show Friday. It was not an easy ride. One caller said May should resign and let a more staunchly pro-Brexit politician take over; another compared her to Neville Chamberlain, the 1930s prime minister who vainly tried to appease Nazi Germany to avoid war. The week’s political turmoil prompted a big fall in the value of the pound. On Friday, it recouped some gains, trading 0.4 percent higher at $1.2821, partly on relief that Gove didn’t join the others in quitting the government. But investors and businesses remain worried about the prospect of Britain crashing out of the EU in March without a deal. That could see tariffs on British exports, border checks, restrictions on travelers and workers, and interruption to the supply of goods. 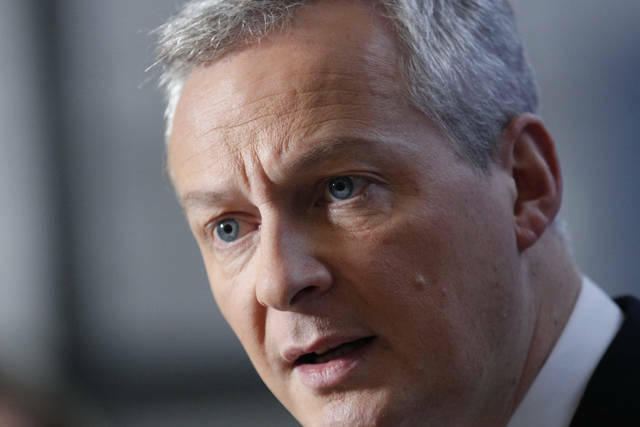 But French Finance Minister Bruno Le Maire called some British politicians “liars” who fooled voters into thinking that leaving the EU would be easy and in their interests. Six years after the euro crisis was supposed to have ended, ill winds of political change are now blowing in Rome and Berlin. They are doing so at a time that Italy, the eurozone’s third-largest economy, is coming under increased market pressure fueled by doubts about the country’s economic outlook and the sustainability of its public finances. This has to once again raise questions as to whether the euro can survive in its present form. In March of this year, in large measure in response to two decades of literally no increase in Italian living standards and growing opposition to Europe’s immigration policy, the Italian electorate abandoned the country’s established political parties. That election paved the way for the formation in June of a populist government comprising the strange bedfellows of the far-left Five-Star-Movement and the far-right Italian League. A unifying characteristic of the new Italian coalition government is its open defiance of the eurozone’s rules, especially in the area of budget and immigration policy. Whereas the European Commission is insisting that Italy’s excessively high public debt to GDP ratio and its shaky banking system require that it limit its 2019 budget deficit to 0.75 percent of GDP, the Italian government is proposing a budget deficit of 2.5 percent of GDP. It is doing so to make good both on the Five-Star-Movement’s campaign promise to introduce a basic income support program and on The League’s campaign promise to introduce a flat tax. The Italian government’s confrontation with its European partners over its rule-busting budget as well as over European immigration policy seems to be playing well with the Italian electorate. This more than likely explains why the Italian government is showing no signs of backing down in its budget fight with Europe despite the explicit warnings from Brussels that the country might be fined for its wayward budget behavior. It also might explain why the Italian government so far seems to be unfazed by the increased yields that markets are requiring from the Italian government to buy its bonds. If political developments in Rome are strengthening the Italian government’s resolve to stick with its budget proposal, political developments in Berlin are reducing the scope of the European Commission to turn a blind eye to Italy’s disregard for the eurozone’s budget rules. Since the trouncing of both the Christian Democratic Union and the Social Democrats in the recent Bavarian regional election, the days of Germany’s Grand Coalition government and of Angela Merkel’s chancellorship would appear to be numbered. It is also all too likely that the next German coalition government will be less European-friendly than the present one is and that the Christian Democratic Union will shift right to fend off a challenge from the far-right Alternative for Germany Party. Especially at a time that the global liquidity cycle is becoming more restrictive, the Italian government would seem to be playing with fire in its budget standoff with Europe. This would seem to be underlined by the fact that since the March election, Italian government bond yields have already doubled to 3.5 percent while the Italian economy has ground to a halt. There is the real danger that if the Italian government makes no effort to reduce its excessively high public debt level, markets could require yet higher Italian government bond yields. That would risk tipping the Italian economy into a downward spiral. It would do so by inducing yet another Italian economic recession, which would only further compromise its weak public finances and its shaky banking system. That in turn would most likely provoke yet another round of bond selling. The changed German political landscape will also make it difficult for the European Central bank to once again ride to Italy’s rescue as it did in 2012 should Italy indeed experience a full-blown financial crisis. This would seem to be especially the case considering that Italy’s current headstrong populist government commands a parliamentary majority. That makes it difficult to dislodge in favor of a technocratic government that is prepared to play by Europe’s rules as occurred in 2011 with the Silvio Berlusconi government. It is hoped U.S. policymakers are paying close attention to European political economic developments and will refrain from indulging in schadenfreude about Europe’s plight. This is especially the case since the unraveling of the euro, coupled with a European banking crisis that would almost certainly follow such an event, must be expected to have major spillover effects to the global economy and to the world financial system. It would do so in much the same as the U.S. Lehman Bros. bankruptcy did in 2008. —Avoid creating or reinforcing unfair bias. —Be built and tested for safety. —Uphold high standards of scientific excellence. —Be made available for uses that accord with these principles. —Technologies that cause or are likely to cause overall harm. Where there is a material risk of harm, we will proceed only where we believe that the benefits substantially outweigh the risks, and will incorporate safety constraints. —Weapons or other technologies whose principle purpose or implementation is to cause or directly facilitate injury to people. —Technologies that gather or use information for surveillance violating internationally accepted norms. —Technologies whose purpose contravenes widely accepted principles of international law and human rights. The objectives it will pursue include some insights into how it will evaluate “being socially beneficial.” “We will take into account a broad range of social and economic factors, and will proceed where we believe that the overall likely benefit substantially exceed the foreseeable risks and downsides,” Google said. This language describes a benefit-cost analysis, yet with a still unresolved twist. For example, specifically what “social and economic factors” will Google employ to operationalize a managerial decision to be “socially beneficial”? Will the word “substantially” be interpreted or defined as, for example, a ratio of 2:1 in favor of benefits before undertaking an AI project? Will there be transparency in this decision-making? If so, how will Google implement this transparency? In addition, to what level does Google consider to be adequate “safety constraints” when developing and deploying its AI technologies? As to “avoid(ing) creating or reinforcing unfair bias,” what company guidelines will be instituted covering this range of bias? Who will be enforcing these guidelines? Will it involve any third-party audits? How often will bias assessments be undertaken? As to opportunities for AI systems “feedback, explanations and appeal,” which people (stakeholders inside or outside of the company) are to be responsible for “human direction and control”? As to privacy design principles, what is Google’s interpretation of “appropriate transparency and control over the use of data”? Further, as to multiple uses of AI technologies developed by Google, how will the company restrict its products from being “dual-use”, i.e., adaptable to a harmful use? Does this mean that if any proposed product has the potential for such “dual use” application, i.e., the possibility of the technology being related to or adaptable to a harmful use, Google management will not consider it for commercialization? The company states that it does not tolerate using Google AI technologies for surveillance purposes that violate “internationally accepted norms.” Nevertheless, this principle may have broad company latitude in interpretation. Google’s search engine left the People’s Republic of China in 2010 when the company decided that it would not work with the communist government’s demands that the search engine remove links that the government required. Fast forward to today and Google CEO Sundar Pichai continues to be supportive of a program called “Dragonfly” that could bring Google’s search engine roaring back into mainland China. Web news outlet Intercept, in an article published in August 2018, outlined what PRC government censorship protocols were being designed into Dragonfly by Google as well as the program’s requirement that users submit identifying information, including telephone numbers, that would be available to government intelligence agencies to investigate dissidents. So how does this type of “exploratory” technology program comply with Google’s AI principle regarding not “contravening … human rights”? Bloomberg Businessweek, in an article published recently, reports that the company’s support of Dragonfly has resulted in several researchers resigning from Google. “I cannot work at a company that will not internally or publicly clarify its ethical red lines,” wrote one former employee in his resignation letter. If Dragonfly continues as an ongoing project, there will be further controversies played out in the media, in Congress, and among its employees. What is next for Google? As the preceding questions and comments reveal, the company needs to develop its Principles of Artificial Intelligence to be operationally effective before implementing them organization-wide. Moreover, for Google, embracing their “social good” challenge is not a moment too soon. Thomas A. Hemphill is the David M. French Distinguished Professor of Strategy, Innovation and Public Policy in the School of Management at the University of Michigan-Flint, and is contributing editor to Regulation: The Cato Review of Business and Government. He wrote this for InsideSources.com.